When an editor first approached you about doing your first non-fiction picture book project, what were your thoughts about taking it on? 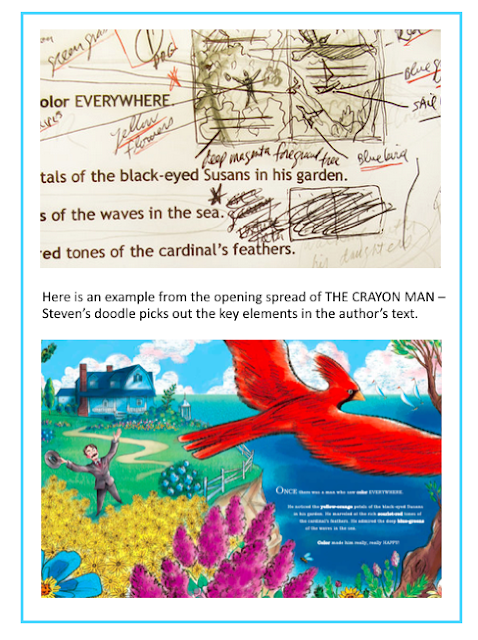 I started illustrating picture books in 2000, and by 2011 had already illustrated 17 popular fiction picture books, and with all of them in a decidedly whimsical style. 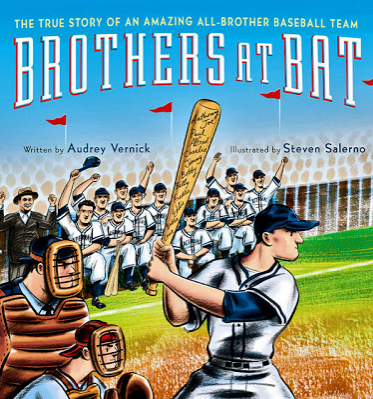 So in 2011 when an editor at Houghton Mifflin Harcourt asked me to illustrate Brothers at Bat (a non-fiction true story about 12 brothers who formed their own professional baseball team and played from the late 1930’s until the early 1950’s) my initial reaction was that of surprise . . . simply because up until that point none of my fiction picture books stylistically suggested that I was the perfect choice to illustrate a non-fiction story that logically would be best illustrated in a more realistic style in order to capture the look and feel of the 1930’s through the 1950’s. I myself knew that I could indeed create wonderful, appropriate illustrations for the story, because drawing in a more realistic manner is not a difficulty at all, but I was curious why the editor took that stylistic leap of faith in me! How is it different illustrating fiction vs non-fiction? A really significant difference is in the research phase . 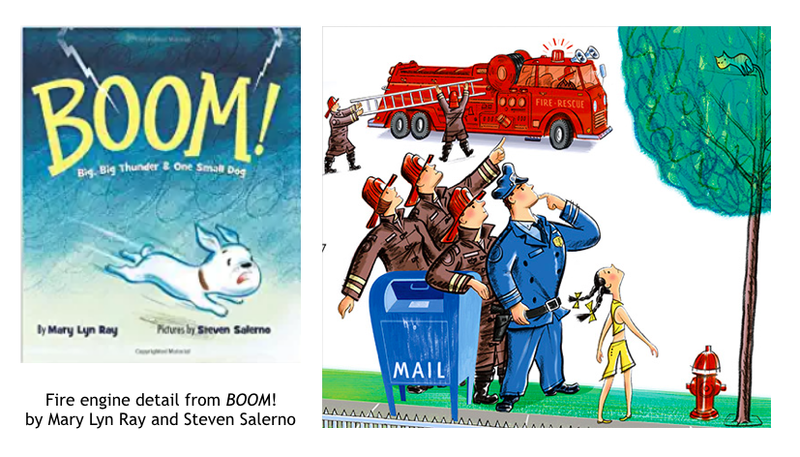 . . For example: In one of the fiction picture book stories I illustrated, BOOM! – about a dog named Rosie who is afraid of thunder, and his owner who comforts her – it happens to mention a firetruck and an orangutan . . . So my research for that book merely involved looking at maybe 50 potential reference photos and narrowing them down to the 2 or 3 photos that I actually used as specific reference. Every other visual element created within the illustrations for BOOM! was drawn out of my imagination without any need for reference whatsoever. And all of the other fiction picture books I’ve illustrated also required extremely minimal reference photo research. At the opposite end of the research spectrum is the amount of research that goes into a non-fiction, historical picture book story. For the seven non-fiction picture book stories that I have illustrated thus far, on average, I probably scour through about 3,000 potential historic/period reference photos in order to narrow them down to the 100 to 150 photos that I actually end up using as specific reference to create the sketches and final illustrations for the non-fiction picture book. by Betsy Harvey Kraft. Note the reference photographs! Another significant difference is TIME! – a lot more time! 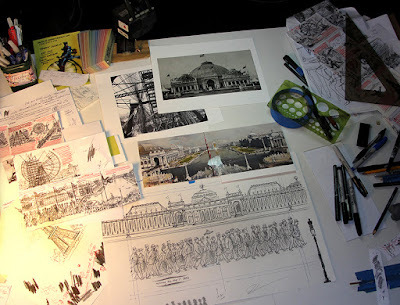 – because of the added time involved with the research phase, and also the significant additional time it takes to create the sketches and final illustrations, which all must reflect real people and places, correct fashions and other objects that are correctly rendered to reflect a specific time period. This is a much slower process! 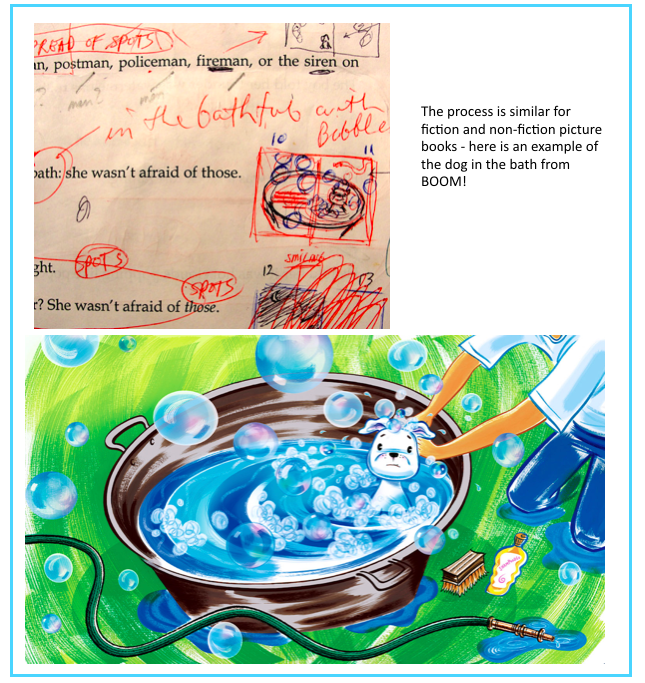 The net result is that creating the sketches and illustrations for a non-fiction picture book, on average, takes me about eight months total, whereas the fiction picture books that I have illustrated, on average, take me about five and a half months in total. Creating these very tiny, visual shorthand rough sketches directly into the margins as I read the story is simply so that I can immediately begin formulating a record of my initial instinctive vision for the illustrations nearly as fast as I generate the visual compositional concepts in my head. 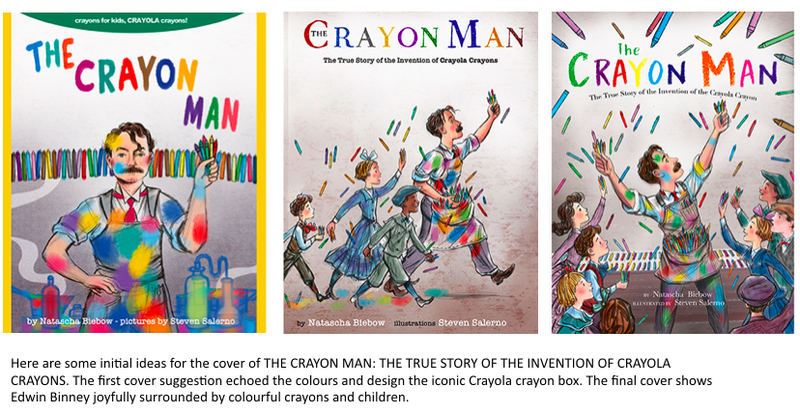 How long did it take you to research reference for your new book THE CRAYON MAN: THE TRUE STORY OF THE INVENTION OF CRAYOLA CRAYONS by Natascha Biebow? It probably took about a month to sort through the roughy 3,000 potential reference photos and narrow them down to the 100 to 150 that ended up actually being used as specific reference to complete the sketches, refined sketches and final illustrations. Where do you find your reference? The author sometimes provides useful reference materials. In addition, some of the reference photos I located were in books, but the vast majority came from on-line searches. This yields many photos, but unfortunately most of them are too small in size, and also of very low pixel resolution, which will not allow them to be enlarged effectively. So, many times, you will find a pertinent photo on screen, but because of its size/resolution limitations, it is totally useless as photo reference that you can actually print out and physically use alongside your sketch and easily refer to. Therefore, online not only do you have to locate a pertinent reference photo, but it also must be of a certain size and resolution so that it can be physically printed out. 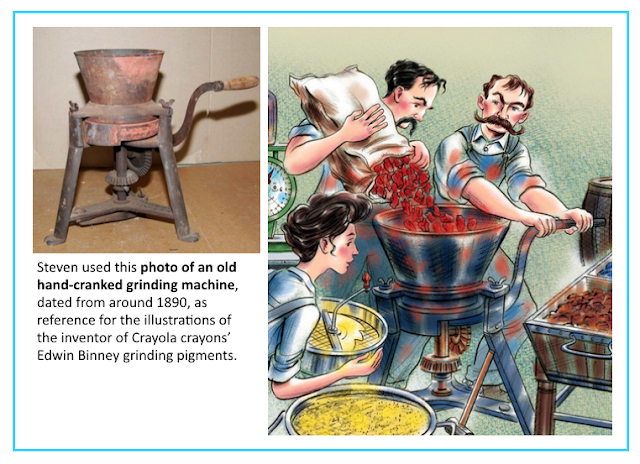 What do you do when you can’t find accurate visual reference for a particular element in the manuscript given that it’s meant to be a true story? This happens a lot! For example, with The Crayon Man, the main character is Edwin Binney, who was, in the story's timeline, about 35 to 38 years old. But the only reference photos of the actual real person that I could find of him were when he was about 57 to 65 years old. 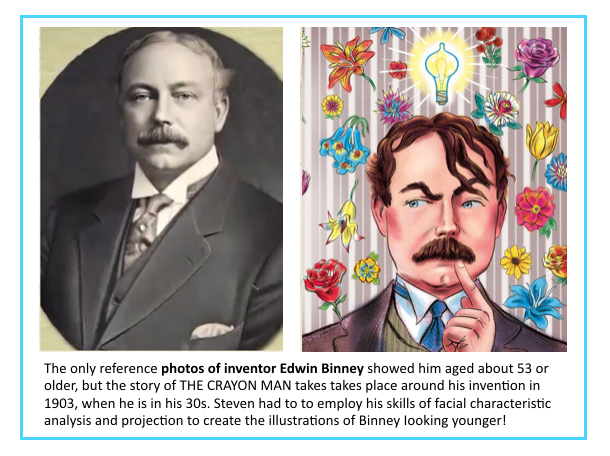 So, to create the illustrations, I had to imagine what Edwin looked like at 35 - 38 years old based on the available photos of him. 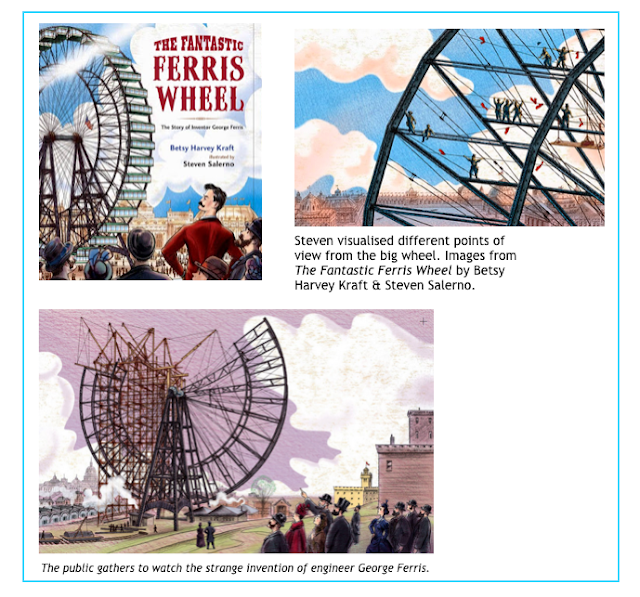 In another example: when I created the illustrations I created for The Fantastic Ferris Wheel, the true story about the making of the first gigantic observation wheel (Ferris wheel) for the 1893 World’s Fair in Chicago. I ran into the following problem: At that time the tallest building in America was only about 30 stories tall . 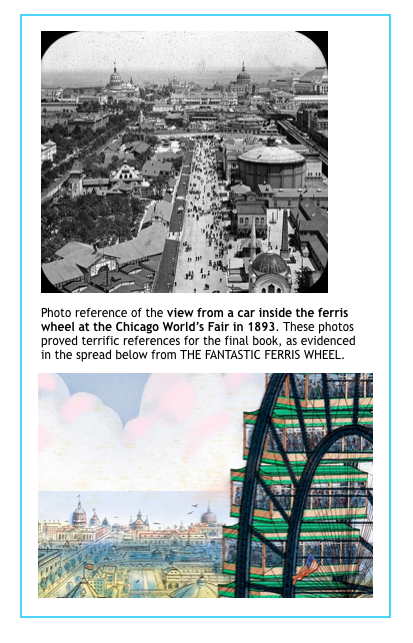 . . and the Ferris wheel was about 27 stories tall . . . which meant that any reference photos I could locate of the Ferris wheel from 1893 were all from an angle looking UP at the wheel. But in my initial sketches I envisioned many scenes that were looking at an angle DOWN at the Ferris wheel. 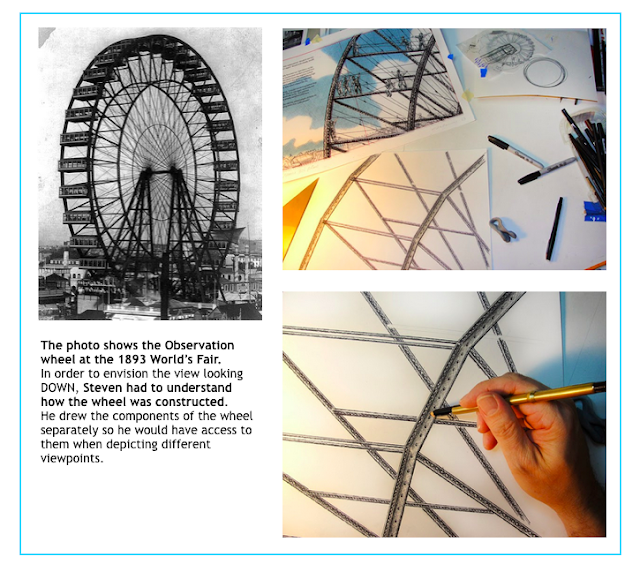 This meant that I had to understand how the wheel was constructed so that could devise angles looking down at the wheel in my drawings . . . which was not easy to do! Can you give some examples of when you completely re-thought an illustration or composition as a result of something you discovered in your research or some feedback you received from the creative team? Before I do any photo reference research myself, I create my initial rough sketches for the book based solely on the events and actions as specifically described by the text, first in a very rough storyboard format. So once I have already determined my intended images for all the inside of the book illustrations via these rough storyboard images, I then do my reference research to specifically support the elements within the sketches. 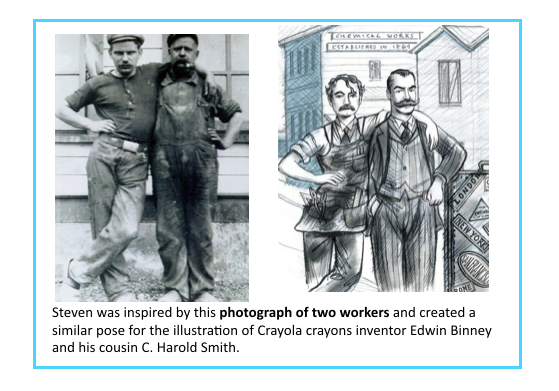 So I have never located a reference photo that completely changed my intentions for the illustrations. Once I complete all my refined final sketches and they are presented to the publisher (to the editor, art director and designer) they offer their comments and suggestions to improve upon the imagery relative to their communication of the story. Usually all of the sketches are essentially approved as is, with only relatively minor tweaks suggested to improve upon their clarity. But their very smart suggestions, though seemingly minor, really do help to make the illustrations truly be their best. Let’s look at covers. What do you think makes for a dynamic and commercial cover? How do you make non-fiction relevant so it grabs contemporary readers? I always feel that any cover, whether for a fiction or non-fiction picture book should essentially be simple, regardless of whether the illustrator’s style is complex or minimalist or anywhere in-between. It should be an evocative, simple, poster-like image that only needs to reflect the core theme or mood of the story, even if in just a conceptually suggestive manner. The basic goal should be to create a visually teasing gem that has the viewer wanting to open the book and look inside . . . What a cover does not have to be, nor should be, is a complex/busy visual scene or concept that overly explains the inside of the book. In my opinion it's ultimately always a much more effective marketing tactic in terms of sales for the cover to just be very simple and striking rather than get caught up in trying to have too many explanatory elements. What is your top tip for illustrators who are considering trying their hand at non-fiction picture book illustration? When I illustrate a non-fiction picture book, I personally take the visual stylistic approach of creating the illustrations in a more realistic manner compared to the more stylized whimsical approach I take with the many fiction picture books I have illustrated. But this does not mean that a non-fiction story MUST be illustrated in a realistic manner. 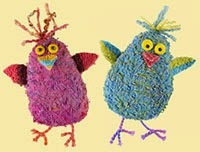 A non-fiction story can be wonderfully illustrated in any manner of illustrative style . . . so the only tip I can offer is simply ensure the illustrations capture the spirit of the real people and events described in the story. 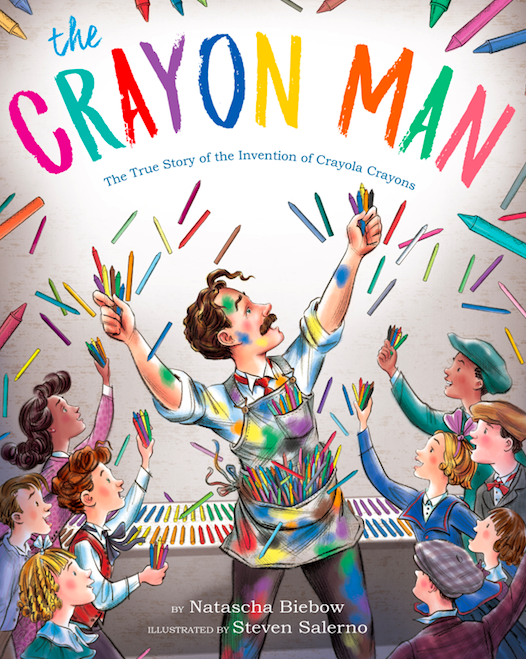 Edwin Binney's inspirational story, THE CRAYON MAN: THE TRUE STORY OF THE INVENTION OF CRAYOLA CRAYONS, will be published in March 2019. Really interesting to read. Thank you, Natascha -and Steven. 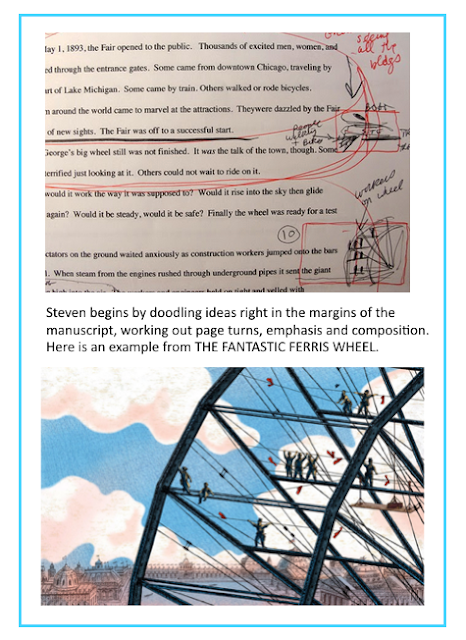 Fascinating to read about Steven's creative process, and see the development of the illustrative ideas, thank you.